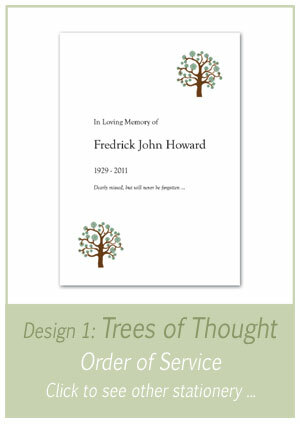 Funeral Stationery designed with thought and respect. Are you looking for a fitting tribute? Do you need simple, stress free stationery? We have experience in producing funeral stationery and appreciate the time constraints you may be under. Take a look through our website and feel free to request a free sample or call. "Millbank and Kent produced the order of service for my Father's funeral using photos and even some daffodils which were is favourite. 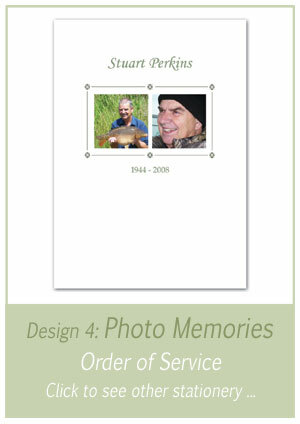 The service of producing the booklets was fast, professional and most importantly, caring and thoughtful". Design: Floral and Photo - with daffodils. 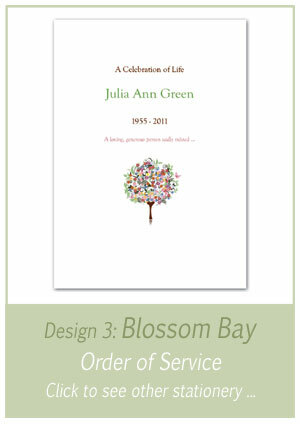 All of our Funeral stationery elements may be changed to match your chosen colour scheme. Millbank and Kent produce Funeral Order of Service and Funeral stationery using high quality Italian card, inserts and envelopes. Millbank and Kent are based in Canterbury, Kent, UK, but we supply Funeral stationery and Order of Service throughout the UK, including, Whitstable, Herne Bay, Canterbury, Faversham and surrounding villages. Millbank and Kent pride themselves in offering a high quality level of service and products. We appreciate there are tight deadlines to fulfill within Funeral stationery . You tell us what you require, and we will make every effort to accommodate your request. We have flexibility within each design. All elements of Funeral stationery required for a Funeral. Funeral Order of Service for the day, Notification cards and thank you cards. 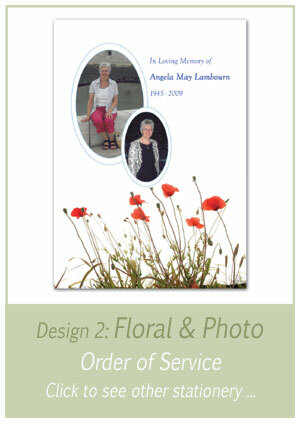 We are happy to send out up to two samples free of charge of our Funeral stationery. We are also able to produce on-line proofing to save time and trees!.